Melanie Icke is Head of People & Education at Phorest Salon Software and has over 25 years experience in the Beauty Business. She ran an incredibly fun and interactive workshop at the 2019 Salon Owners Summit, where she took attendees through how to use a tool called the DiSC method to decode people’s behaviours and find out what their needs are, what motivates them and what closes them down. You can use this method to communicate better with staff, and upsell more retail and treatments to clients. First of all, the DiSC method helps to understand where you and your employees sit in the personality spectrum. This can be a fun game to play at a staff meeting. Melanie began by asking workshop attendees to get out of their seats and stand at opposite ends of the room based on whether they saw themselves as more action-led or more thoughtful. When there’s a job at hand to get done, do you rush right in and get to work, or do you prefer to think through the options before taking action? 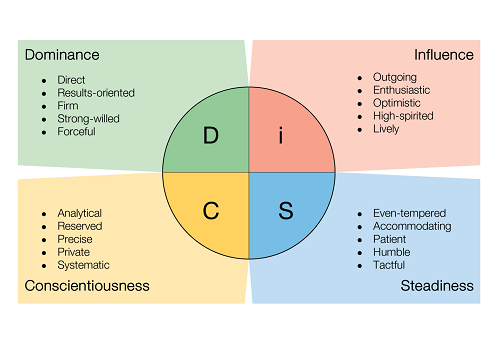 This alone can determine if you’re at the upper end of the DiSC circle – dominant and influencing, or at the lower end – conscientious and steady. Then, she asked those two groups to separate themselves further, creating four groups based on whether they saw themselves as questioning or accepting. When deciding on the way to go about that task, are you led by logic and numbers and challenge the status-quo, or do you accept how things are done and think more about the people you’ll be working with, what they need and what they will bring to the table? No personalities are better or worse than others, and no one is entirely black and white; people are usually made up of little parts of the full circle, but using the DiSC method & its very basic groupings, you can get a good idea of what the dominant part of your personality might be. It’s also important to understand that you cannot change the personality type of others, but by understanding where yours and their personalities fall, you can ‘flex’ your behaviour and the way you communicate with them to make your messages resonate better with them, thus improving communication and getting better results. Through Melanie’s example of how this might work in practice, you can see what strengths and weaknesses each of the personality types bring to the table. Her scenario: imagine that each of these personality types were to go into a store to buy a washing machine. Likely have done their research online, the ‘dominant’ personality, already know what they want, and be looking for a store assistant to give them exactly that with swift service. They wouldn’t want any opinion or upsell. The ‘influencer’ personality would be a bubbly character, giving the store assistant the story of their needs and what they want from a washing machine, wanting to talk through the different options and get the assistant’s opinion. The ‘steady’ personality will probably have done a mix of both. They will have thought about their needs and researched some models online, but they’ll also want the store assistant to give them their opinion or stories of how a certain machine was perfect for someone like them. And finally, the ‘conscientious’ personality will have meticulously researched everything about washing machines in advance – the spin speed, the load weight, the energy consumption, drum size and so on. They will almost be more of an expert than the store assistant by the time they’re ready to purchase. From talking to clients on a day to day basis, without knowing it, your staff will likely already be quite adept at picking the correct personality type of clients – particularly now that they will know what to look for. They can then use this information to sell retail products to them in a way that will resonate better with them. Do they need to test out a bit to see it in action, do they need to be told the benefits of some of the ingredients, do they need to hear you’ve tried it for yourself and loved it? Try implementing the DiSC method at your next staff meeting and let us know the results! Featured imaged shot on location of the Salon Owners Summit 2019, in Dublin. Photo by Alan Rowlette. © 2019 Phorest Salon Software. Sorcha Mullis is an award winning digital marketer and search engine optimisation (SEO) expert. As well as managing the Phorest Salon Software website to help salon owners find solutions to the problems they run into when managing a salon; she also contributes to the Phorest blog with tips to help salon owners leverage their online presence to get their clients back in more often, spending more and generating referrals. 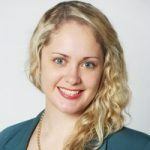 Sorcha has headed up SEO teams in Perth and Dublin, and over the past 10 years has helped businesses in all industries increase their visibility online in order to increase website traffic, bookings and sales.